After marrying in the fall of 1971, Mike and Connie traveled by motorcycle down the east coast to Florida and back again, only to continue out west across Canada by train, and then down to California by thumb. In the fall of ’72 Mike and Connie returned to the University of Guelph. After two semesters Mike left to find work in golf course maintenance and finally a sheet metal shop for two years. Connie finished her degree of Dramatic Arts and waited tables at the local Pub. While in Guelph, the couple lived in a small farmhouse where Mike became a vegetable farmer/cash cropper. These were definitely the ‘Hippie’ years. Along the way, friendships and a lifestyle were established. Cobalt Pottery was established, and for almost 4 years, Mike and Connie enjoyed life of northern Ontario and all it had to offer. “We lived on a lake with no one else”. The house was an abandoned Mine Managers home adjacent to a silver mine with a mill. The lake was half filled in with “slimes” or the crushed tailings from the old silver mine. Cobalt and the near north were an inspiration to last a lifetime. Two of the Leishman’s three daughters were born in Haileybury. The third daughter came along in a “shut down the highways” snow storm in early February 1979 in Collingwood. Their new address was R.R. #1 Stayner, just 4 klicks south of Wasaga Beach, 1 1/2 hours to downtown Toronto. The Leishmans dream while attending University and beyond to Cobalt, was to own a school house pottery business. In 1979 Mike and Connie both at the age of 29 along with their three daughters, Ivy, Ana and Katy were “livin’ the dream”. For the next 15 years, the Leishmans attended hundreds of outdoor art shows throughout Ontario. The ‘One of a Kind’ show in Toronto was the biggest for the Leishmans starting in 1979 and continues still to this day. At the same time, to raise a family on a potter’s wage took some doing, one pot at a time. A name was being established both in the retail market and the wholesale market. 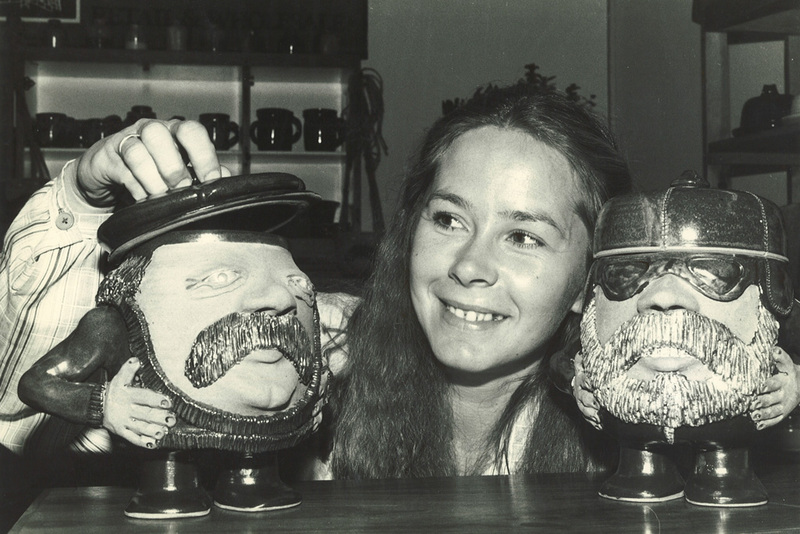 In the 80’s the Leishmans were well known for their mugs and pots with faces. From the Stayner schoolhouse it was a quick market in Toronto only 1½ hours away. In 1990, Mike and Connie decided to establish a new product line, pottery that felt and looked Canadian. All of their past experiences, from Art College, to Dramatic Arts, to living in the near north came into play to create this new pottery design. What resulted was a natural clay hand stamped with a loon motif on pottery that would be used daily; a kind of rustic and refined stoneware. For the next 10 years the Leishman’s established a wholesale business that saw their products sold in galleries and gift shops from Coast to Coast. “We had pots in every province, the Yukon and Nunavut, all the way to Newfoundland”. Along the way other designs were added to make the Canadian Wildlife Collection.